How do you find the best church web host? Whether you are building a pastor web site or a church web site, your host needs to understand the realities of the web. Does a web site exist if no one sees it? Does a web site minister if no one visits it? Do you have an effective church web site if the only things it reveals about you is your service schedule, building location, and your basic beliefs? Most church web sites do a good job telling people the basics about their church ministries. But the disappointing reality is that very few people ever see the church sites. Because, the idea that, "If you build it, they will come," doesn’t work on the internet. People won’t just show up at your site simply because you list your web address in the newspaper. And that’s what the typical church web host doesn’t understand. Well, to be more precise, your church web host isn’t really concerned with whether or not your site receives visitors. Their concern is making sure your site is always visible on the web. And almost every church web host does that pretty well. What most church web hosts don’t do is help you actually reach people. But if your site doesn’t reach people – if people don’t visit your site – what’s the point of having a site? What’s the point of using a church web host? It’s time to rethink church web sites and church web hosts. If you want to get more out of your church web site, simply change its purpose. Most church web sites try to inform visitors about their church. I suggest that you change your purpose from providing information to providing a service – a ministry for your community. After all, you are trying to reach and minister to your community – not just tell them about your church and pastor. What are people in your community looking for on the internet? When you answer that question, simply build a church web site that provides what your neighbors are looking for and you will have more visitors to your site than you ever imagined. Use your imagination and creativity as you read these church web site ideas. Schools. Most school web sites are designed to inform, so you will have relatively little competition if you build a church web site that focuses on the local schools. Do teacher profiles, provide lunch menus, write articles about sports events, describe upcoming music concerts and theatre events, get permission to list the names of kids on the honor roll, get pictures and biographies of kids who will be graduating (a series of “this is your life” photographs with the child’s senior photo would generate a lot of interest), develop an online college and career fair, and have some articles written for your site that give tips on paying for college and finding scholarships. Sports. People love their home teams. But in most cases there is no single source for information about all the sports team in a given geographical area. For instance, within a short drive from my church, there are at least a dozen major high schools, a Division I NCAA college (go Spartans! ), a minor league baseball team, several Division III colleges, and untold numbers of local softball, soccer/football, baseball, hockey, volleyball, golf, and basketball leagues. No one is covering most of these teams in any kind of comprehensive way. Enter your church. You could become the number one source for sports information in your city. Write articles on individual teams, player profiles, injury reports, schedules, standings, and of course the games themselves. And then sponsor all-city sporting events to attract interest in your church. Local Entertainment. What do people do for enjoyment in your area? You could provide restaurant reviews, movie reviews, recommended day trips, and a guide to family outings. You could write about hotels and bed-n-breakfasts in your town. Write about the best romantic places in your city. Discuss holiday events, fairs, and festivals in your area. Create a web site that everyone uses when they want to find some place to relax. Local News. Your city probably has a newspaper, radio station, and television station. They do a pretty good job keeping people informed about the major events in your area. But what about all the “little” stories that get missed? Write articles about good news. Profile area leaders. Report on neighborhood events that get missed by other news sources. As you delve deeper into the local stories that surround you, you will gain a better appreciation for your community – and they will have a better appreciation for your church. Spiritual Guidance. People are searching for answers to some of the most important questions in life. But many – if not most – people will not attend church to find the answers. So use a web site to take the answers to them. Local Online Directory. You can already find nearly any address and phone number on the internet. But what you don’t get is a feel for what a business is like. Use your church web site to profile area businesses. After you write your profile, invite readers to comment on and rate each business. Your site will become the best source of information about local businesses. These are just a few ideas. Use any of these church web site ideas, a combination of these ideas, or develop your own. The key is simply to create a site that attracts visitors. 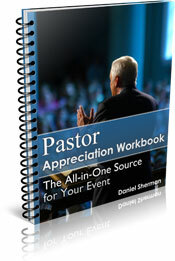 The best way to choose a theme for your church or pastor web site is to base your decision on the law of the internet. Internet Law: Fill your site with content that people are searching Google for and you will have more traffic than you imagined possible. What’s the best church web host? My highest recommendation goes to a company called, SiteSell. They created Solo Build It, which in my opinion is the best, most thorough, and easiest way to build a site and get it hosted. But don’t take my word for it. Click here to learn how to choose the best church web host. You may wonder why I promote Solo Build It. The truth is twofold. I make a commission when someone purchases Solo Build It for one. But the main reason is that I believe in it. I use it, love it, and strongly recommend it. I promise to use it only to send you My-Pastor Minute.